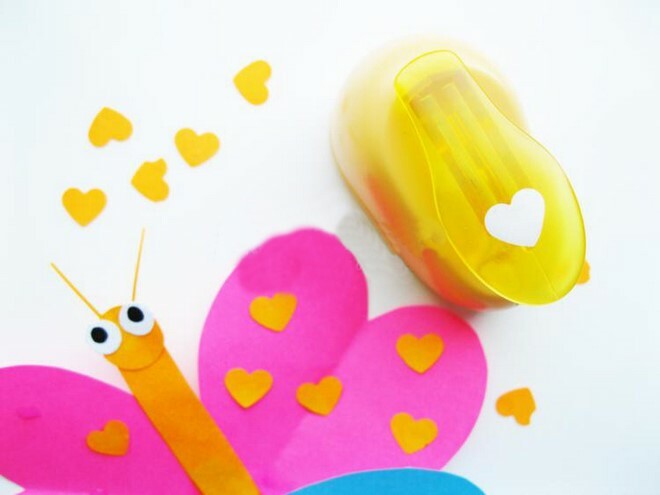 Together with the child try making such a bright and colorful butterfly from paper hearts. You will not need many tools and materials. And even if you did not have colored paper on hand, you can make it out of ordinary white paper. 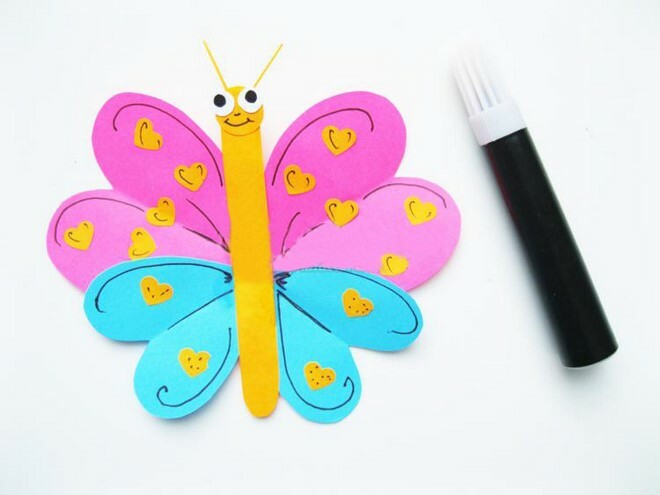 Then the child will be able to decorate the finished butterfly with colored pencils, markers or paints. 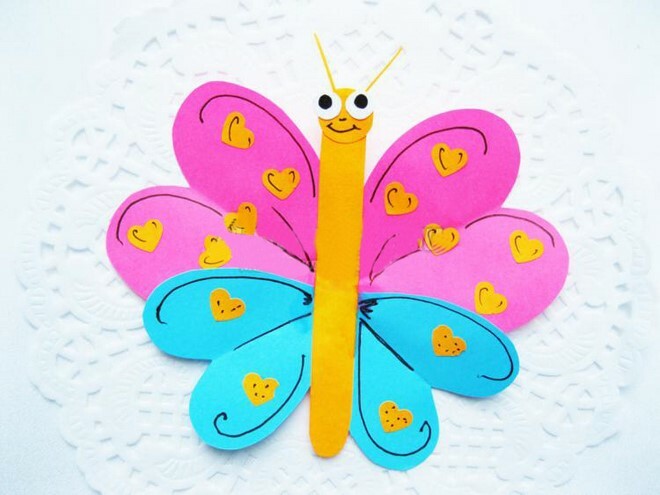 Make the beautiful wings of the butterfly in blue and pink. Take a sheet of construction paper of these shades and cut out squares of 8 x 8 cm (3 x 3 inches) and 5 x 5 cm (2 x 2 inches). In the middle of each square we make a fold. 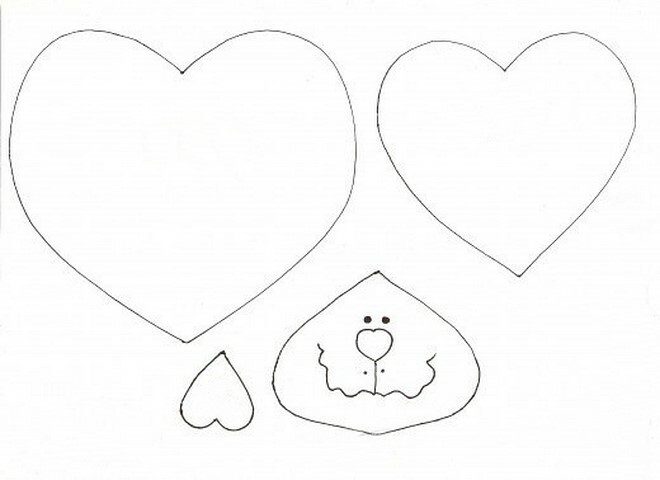 Drawing half a heart on the fold produces a complete heart unfolded. As a result, we get heart shaped wings. 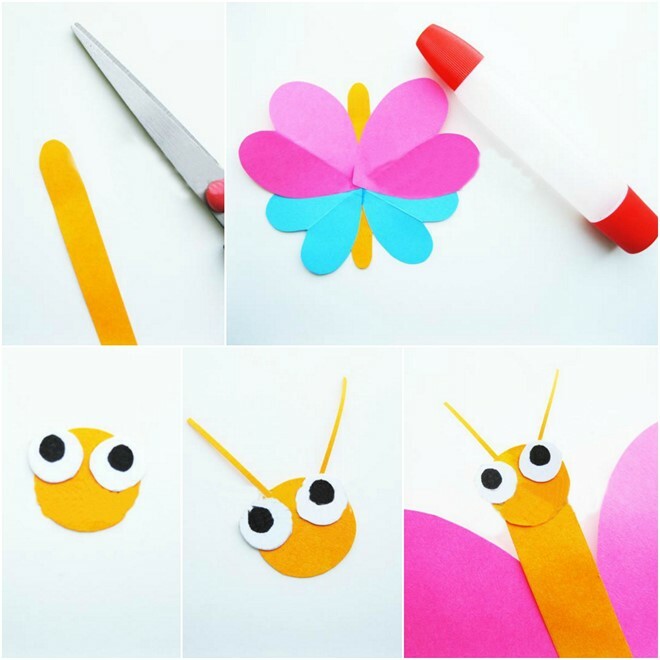 To paste the wings – you need to make a butterfly trunk. 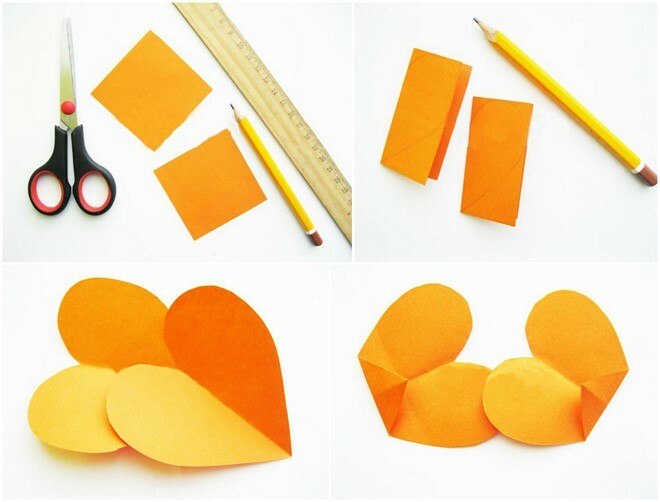 To do this, cut out of orange construction paper a long strip. Round off the edges. 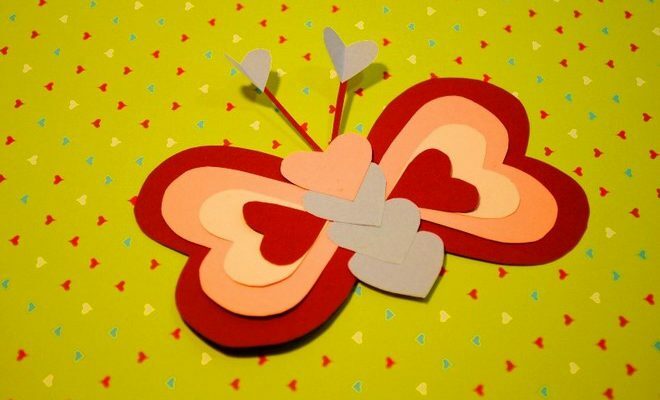 Glue the wings to the body – the big pink hearts at the top and the blue ones under them. 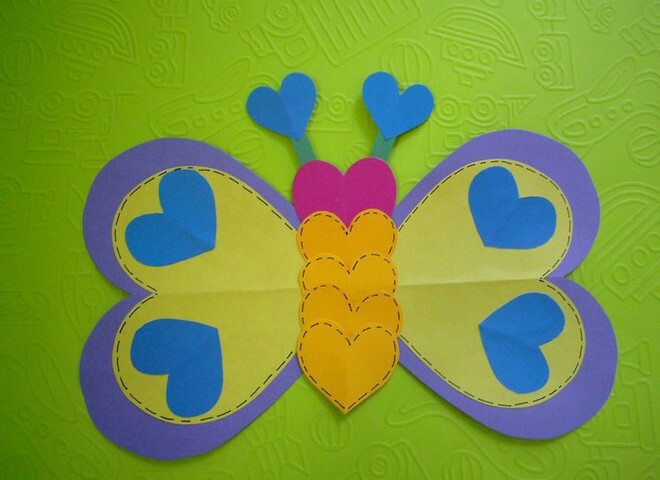 Then, make a butterfly’s head. 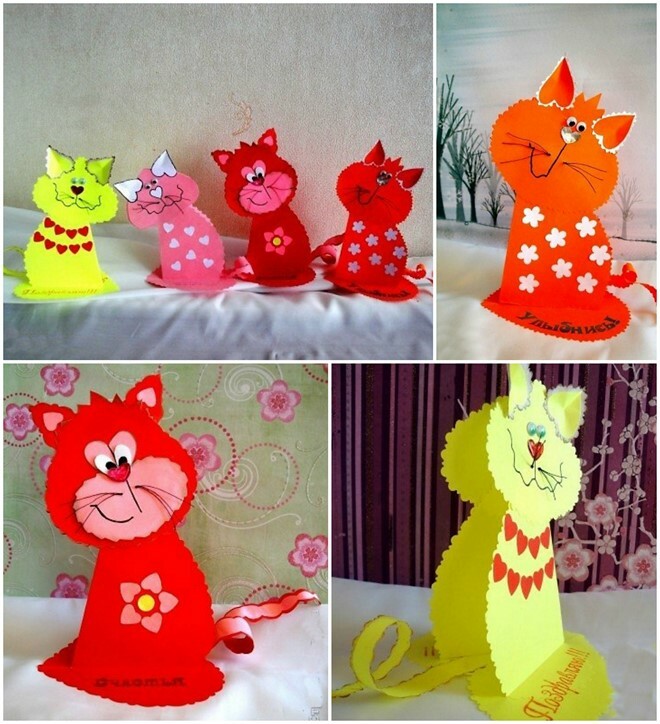 To do this, cut out a small circle from the orange sheet of construction paper. 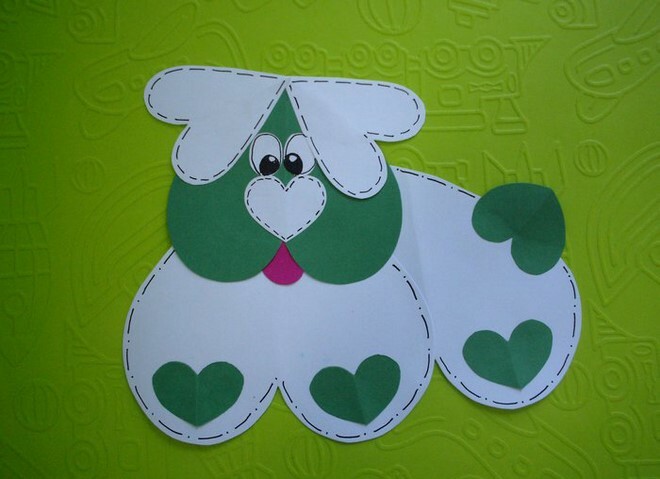 From white paper cut out a pair of small circles. Draw the pupils on them and paste them on the large circle. Let’s add the antennae. 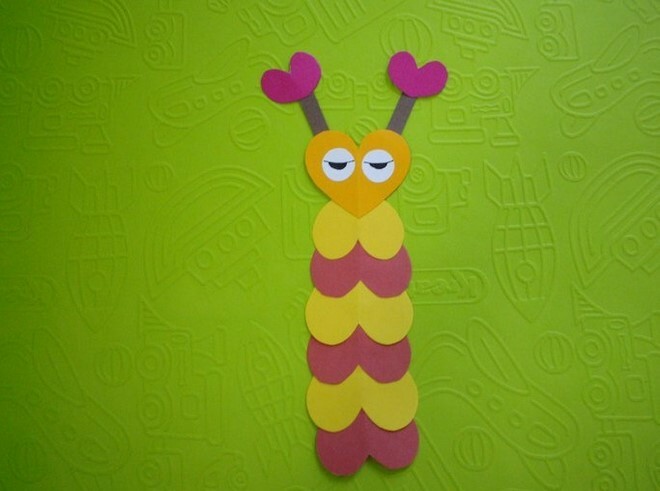 To do this, cut out thin stripes in the same color and glue them using craft glue on the back of the head. When it’s ready, glue the head to the body. Now let’s decorate the wings of a butterfly. 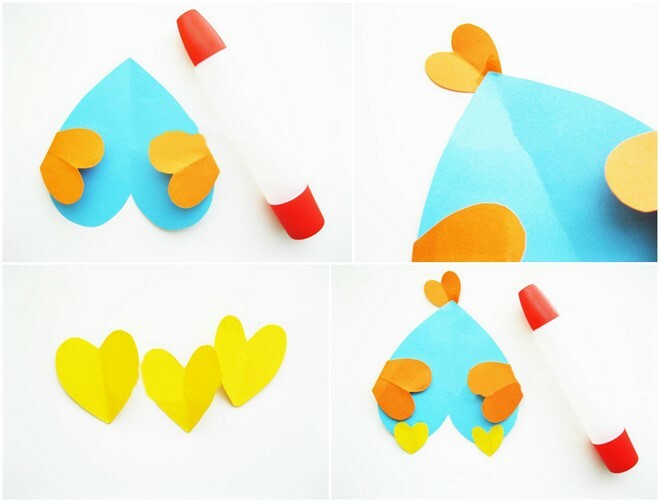 Take a heart shape punch and orange construction paper, make many hearts and glue them on your blue and pink wings. 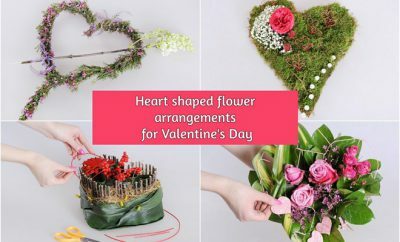 You can either paste them chaotically or create an interesting pattern from hearts. Let’s take a felt-tip pen and add some finishing touches. On the head you can draw the nose and smile. 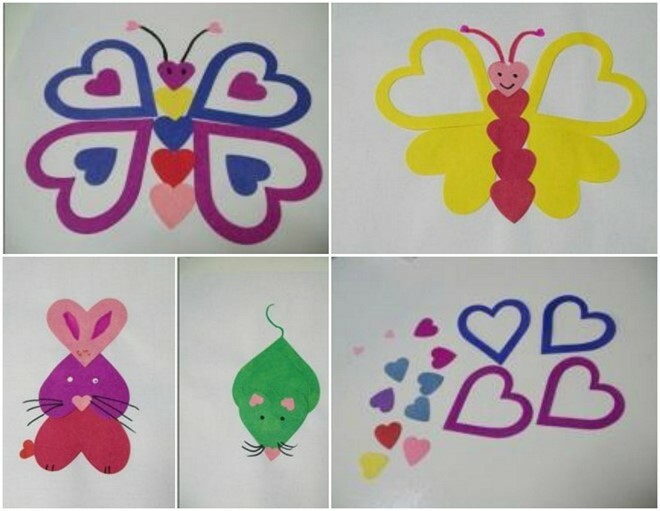 And now, the bright butterfly made of colored paper is ready to fly away to your Valentine! 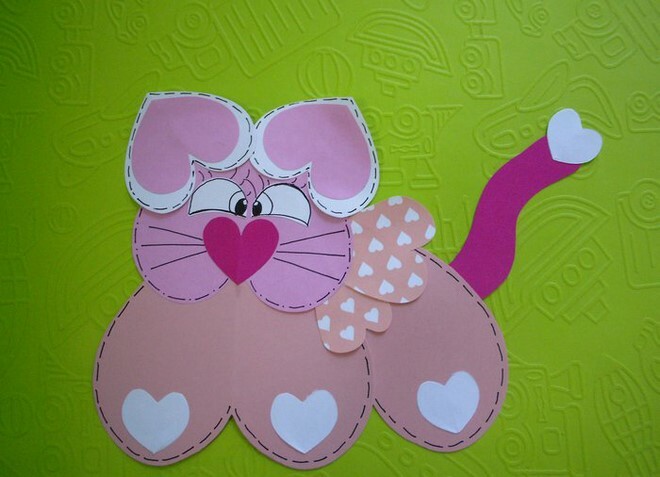 Take a sheet of construction paper in pink and cut out of it a square 11 x 12 cm (4,3 x 4,7 inches). Fold in half and on one of its folded sides draw half of a heart shape. 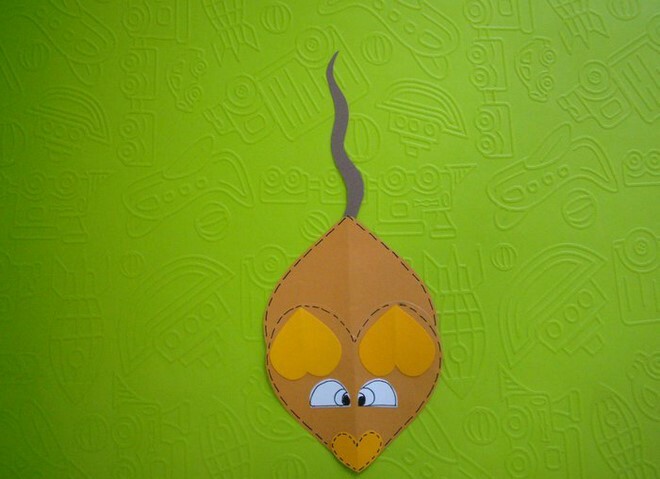 Carefully cut out with scissors along the pencil lines. As a result, we got a beautiful and big heart. This will be the body of our fish. Next, take the navy blue and turquoise blue paper and cut out squares of 6 x 6 cm (2,36 x 2,36 inches) and 5 x 5 cm (2 x 2 inches). You need two identical squares from each. Fold them in half. 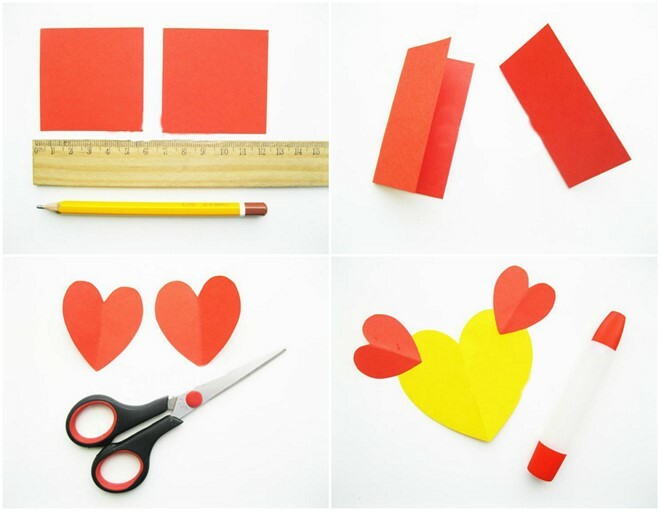 On each half, outline the silhouettes of hearts using a pencil and cut out. 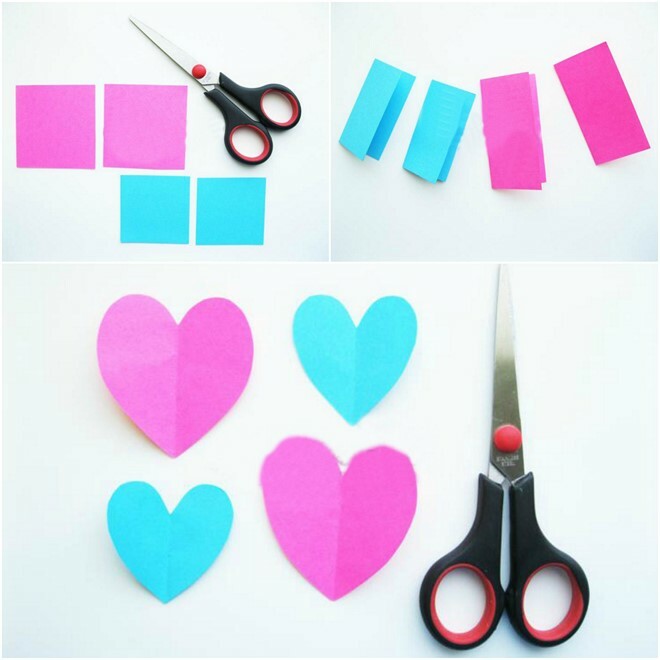 Using scissors make fringes on the dark blue hearts. 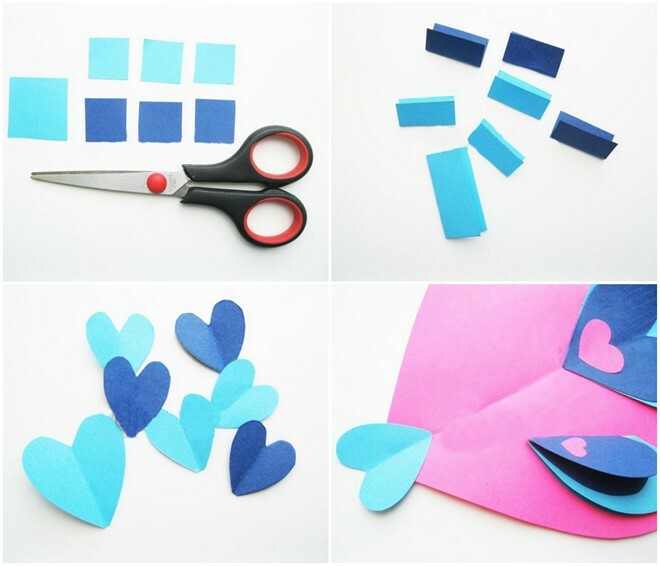 Glue the small turquoise hearts to the blue hearts and then paste them on the body. Now the fish has a tail and a dorsal fin. Again, take the navy blue and turquoise blue and cut out of them squares of 4 x 4 cm (1,5 x 1,5 inches) and 3 x 3 cm (1,2 x 1,2 inches). 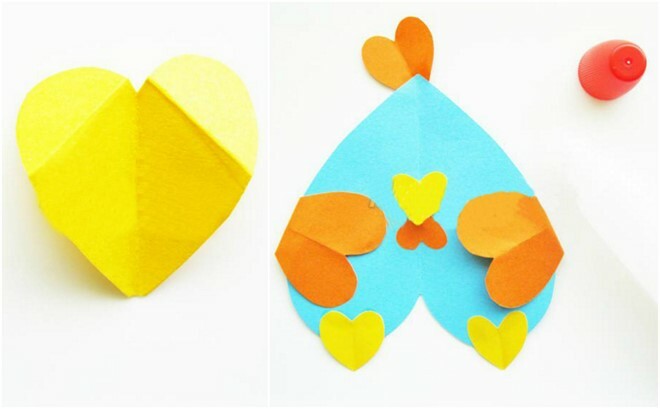 We fold in half and cut out heart shapes. 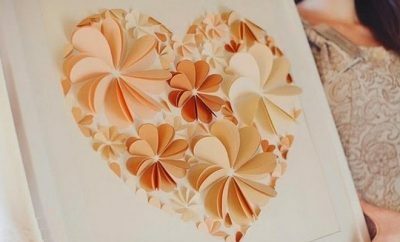 Do not open the folded hearts. 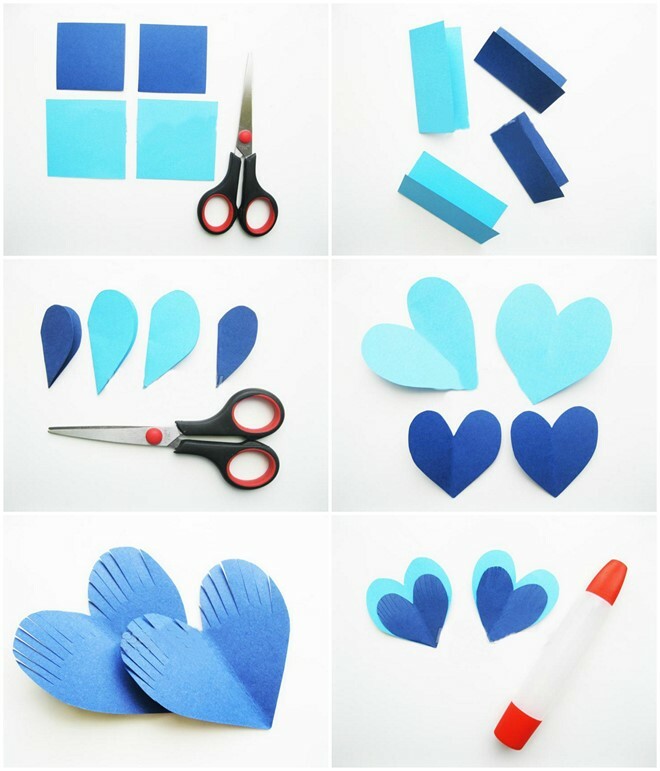 Paste the navy blue heart over the turquoise blue and glue them on the body of the fish. 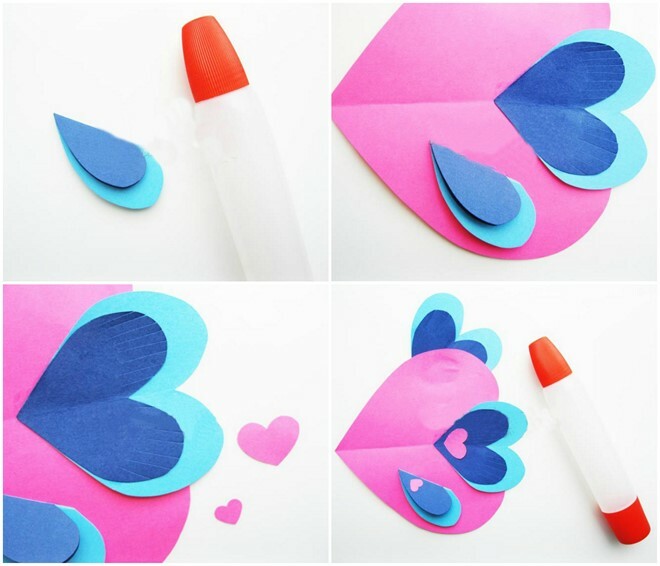 Cut out small hearts from pink paper and glue them on the blue ones as shown on the pictures. Now let’s make several small fish scales from turquoise and navy blue. 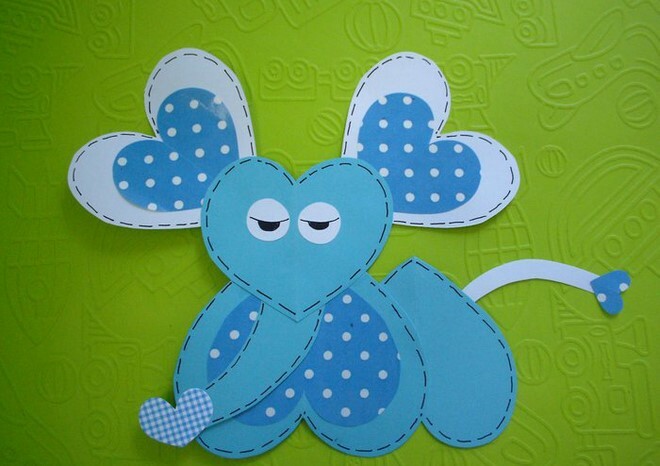 For the mouth, cut out a square of blue paper 3 x 3 cm (1,8 x 1,8 inch), and for scales – 1.5 x 1.5 cm (0,6 x 0,6 cm). 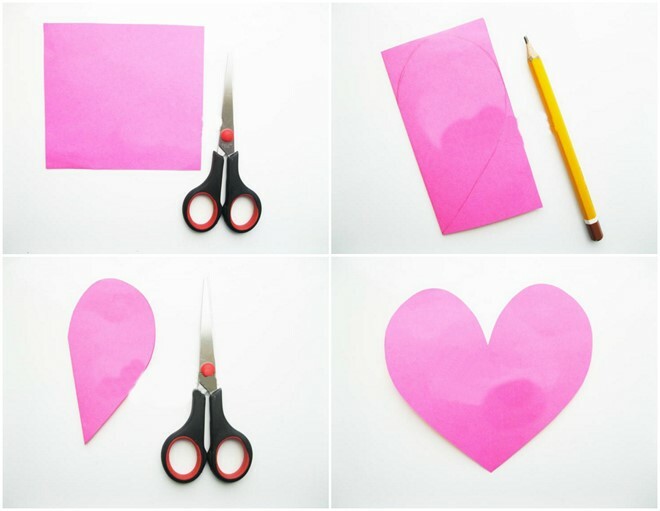 And again: fold all the squares in half, draw hearts and cut out with scissors along the lines. 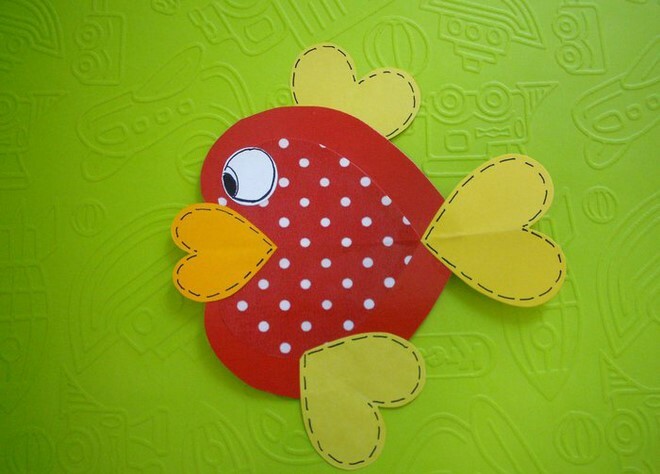 Glue the mouth to the pointed tip of the pink heart, the body of the fish. Then, glue the scales: first the turquoise hearts and on top of them – the navy blue hearts. Make the eye of the fish. 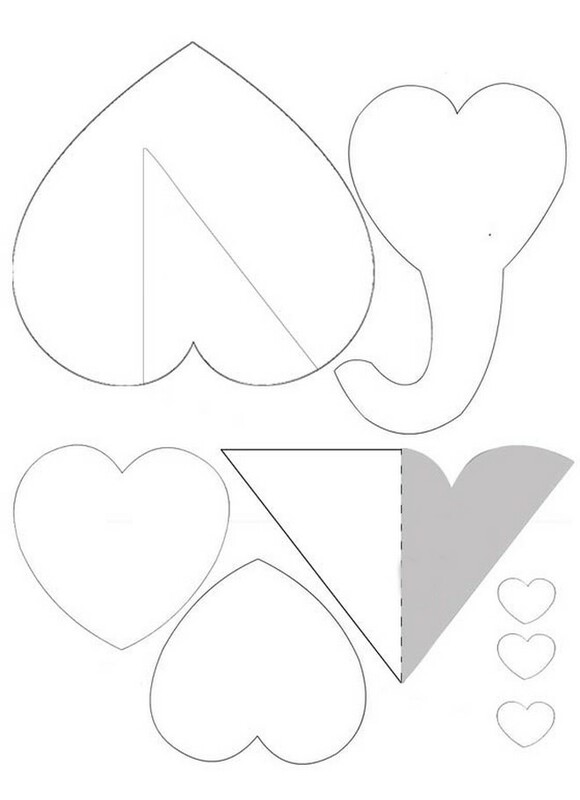 Cut out a white and black heart of different sizes. Glue them together and afterwards the ready eye on the body of the fish. 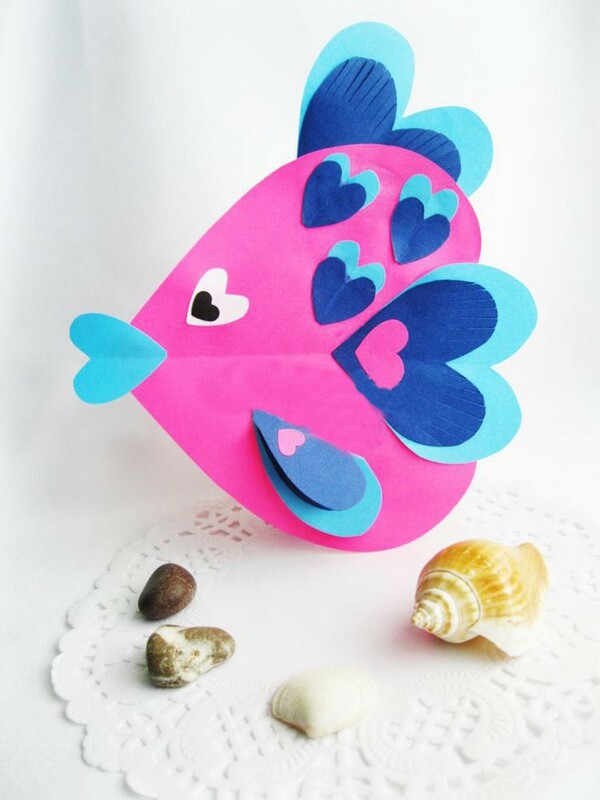 Your fish of paper hearts is ready for its first marine adventure! 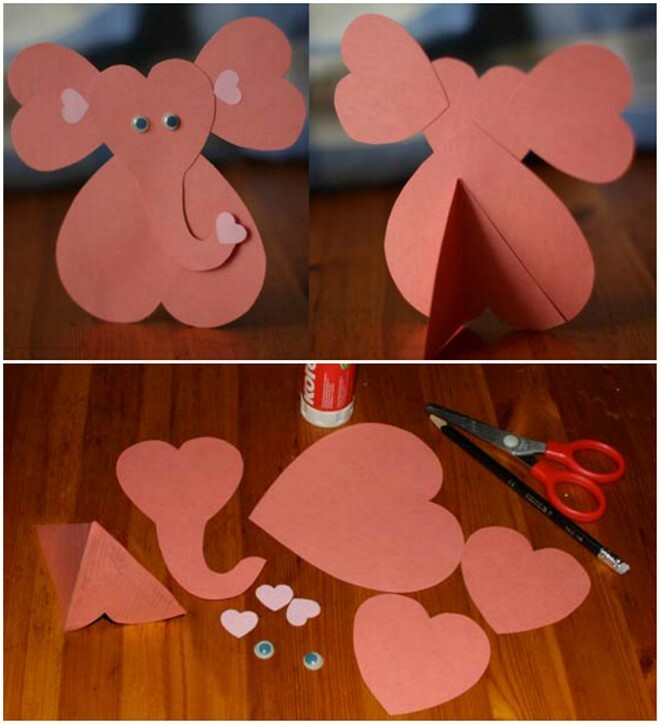 This elephant made of paper hearts can serve not only as a Valentine’s Day card, but also be an invitation for a children’s birthday party. 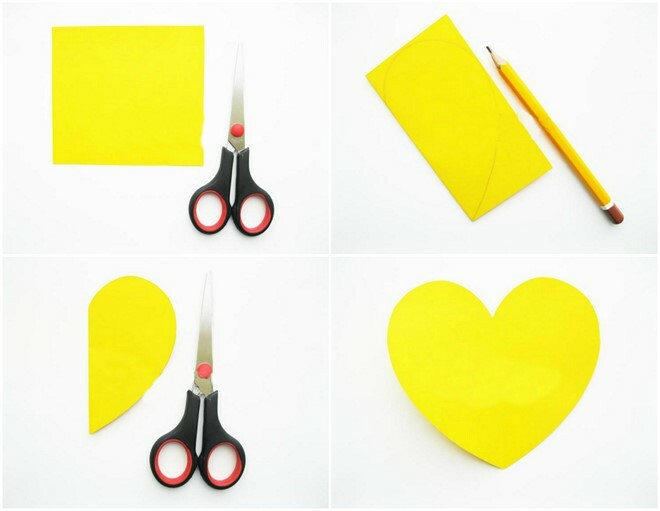 Take an yellow sheet of paper, cut out a large square of 12 x 12 cm (4,7 x 4,7 inch) and make a paper heart. This would be the head of our elephant. Now make the ears from red paper. The dimensions of the squares will be 6 x 6 cm (2,4 x 2,4 inch). 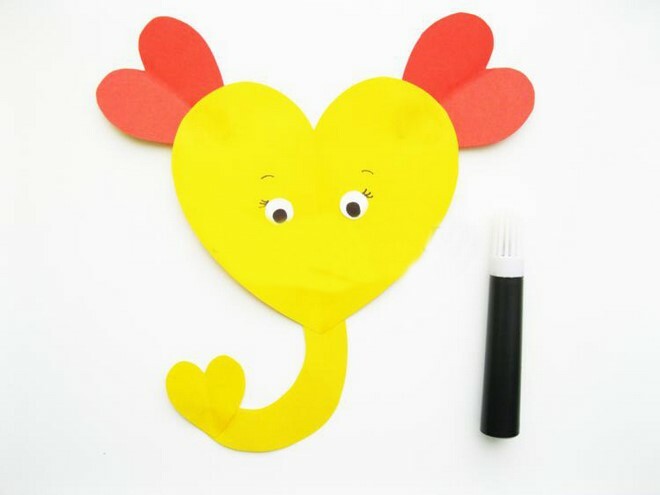 Glue the red ears on the yellow head of the elephant. Now make the trunk of the elephant. 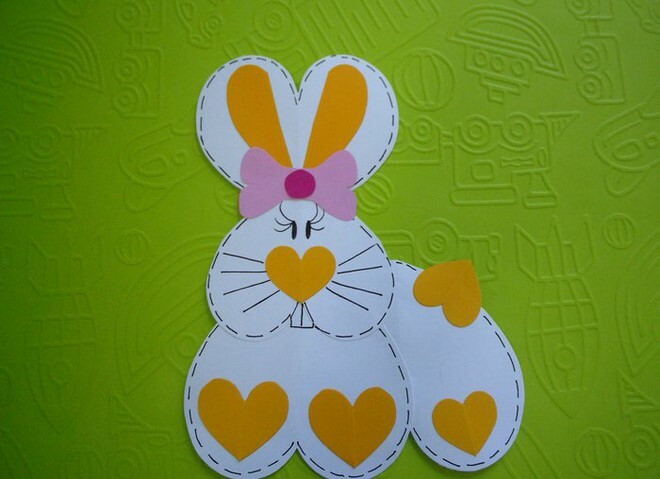 Cut out a small square 3 x 3 cm (1,2 x 1,2 inch) and a rounded strip of paper in yellow color. The finished trunk is glued to the back of the head. It is time for the round eyes. Take a white sheet of paper and cut out two circles. Using black marker draw the pupils, eyebrows and eyelashes. Glue the eyes in the middle of the head. 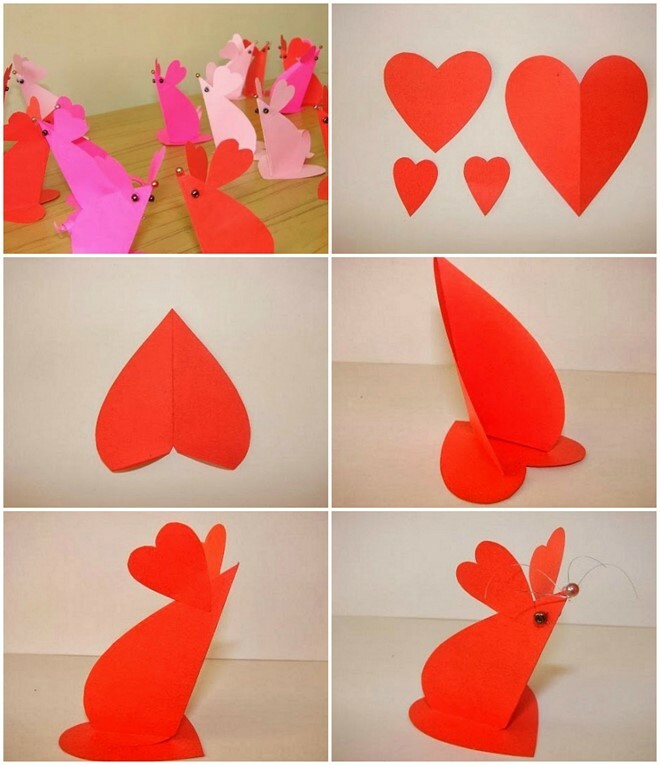 From a red sheet of construction paper cut out a small heart and glue it to the end of the trunk. Take a marker and write a pleasant phrase or a wish to the person to whom it is meant. 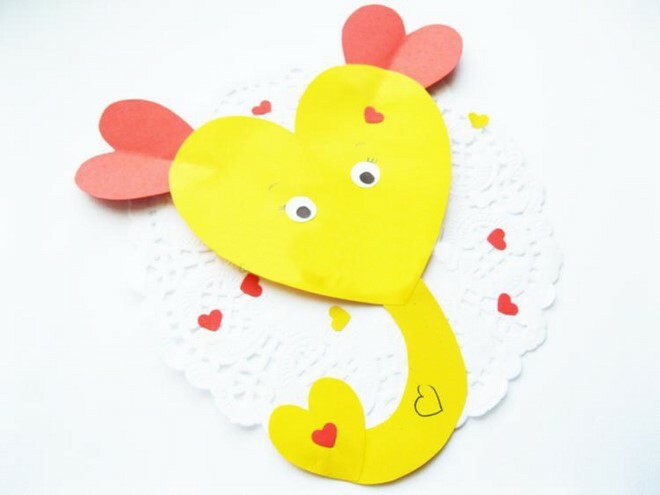 Our cheerful and funny elephant of paper hearts is ready! 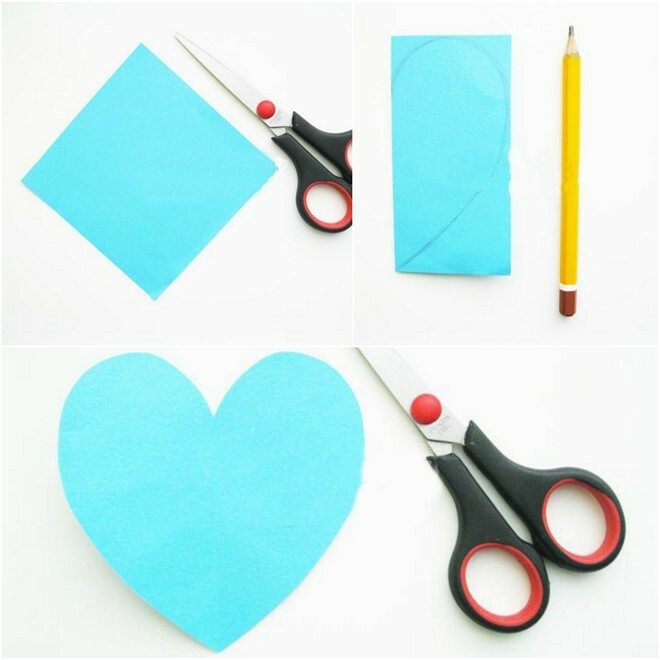 Take a piece of paper in blue color, cut out a 11 x 11 cm (4,3 x 4,3 inch) square and transform it into a heart shape. This will be the body of the chicken. Now let’s make our chicken wings. 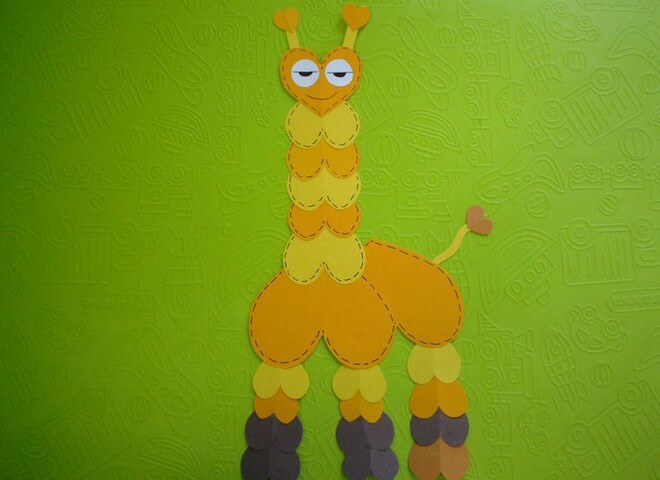 To do this, take a piece of paper in orange color and cut out 2 squares of 6 x 6 cm (2,4 x 2,4 inch). These beautiful heart shapes will serve as wings. Before we attach them to the trunk – you need to slightly fold the ends. 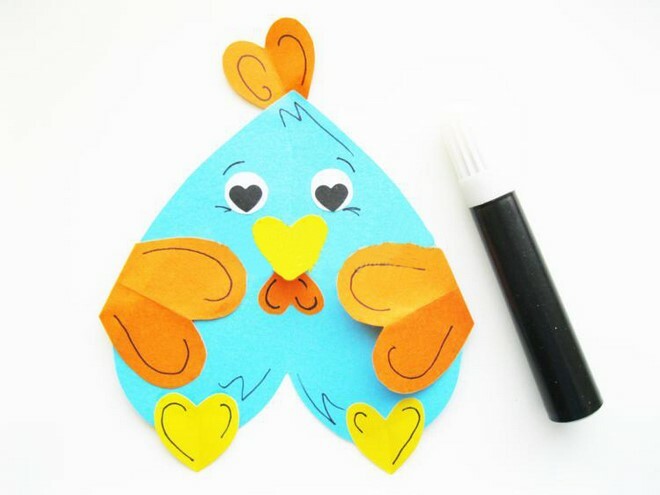 Now put a drop of craft glue on the folded sides and glue them to the back of the chicken’s body. Thus, its wings will open and close. Let’s make our little chicken comb. 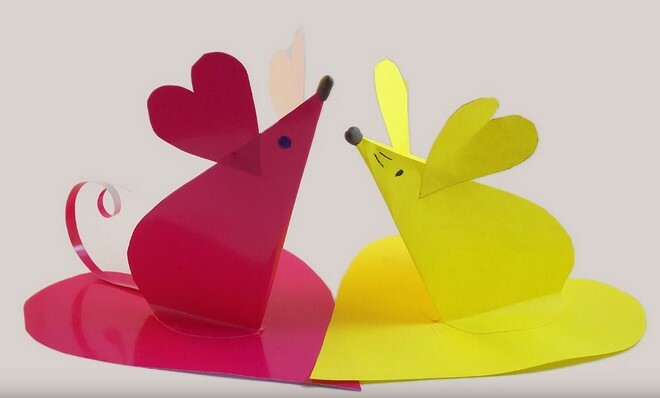 It will be made again out of construction paper. Cut it out and glue it to the very top of the big paper heart. You can slightly shift it to one side. Now proceed to the legs and beak of the chicken. 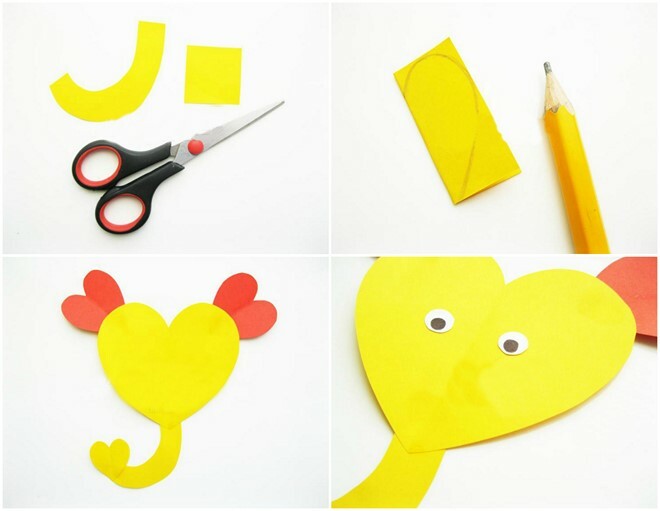 To do this, we need 3 identical hearts cut out from a yellow construction paper. Glue both hearts at the bottom of the big heart. 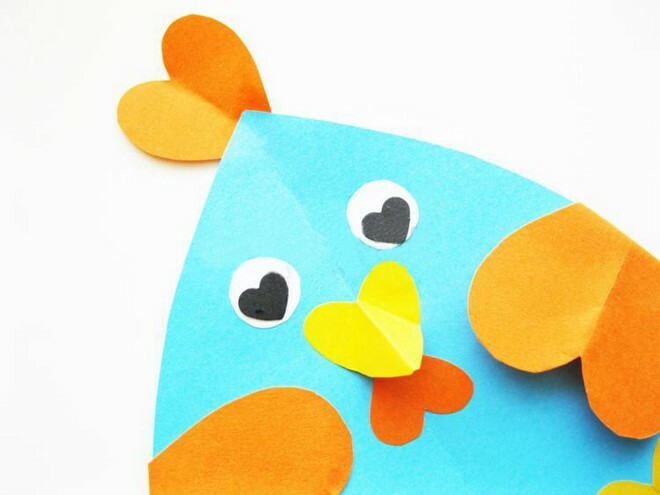 For the beak – fold the heart obliquely as shown on the photo to create a three-dimensional effect. Glue it in the middle. 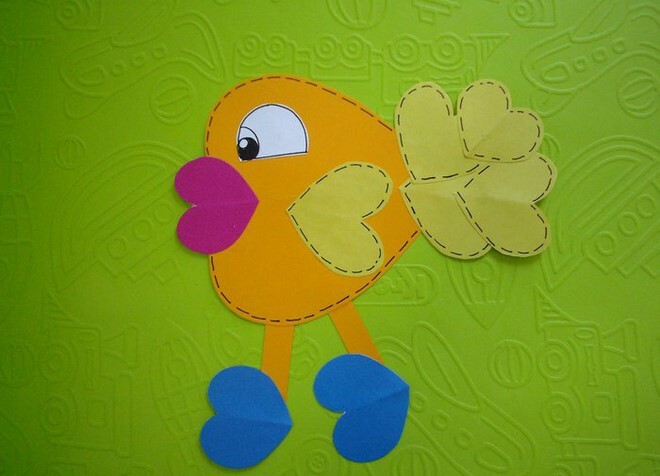 Cut out another small heart shape in orange color and glue it below the beak. Now make the bird’s eyes. 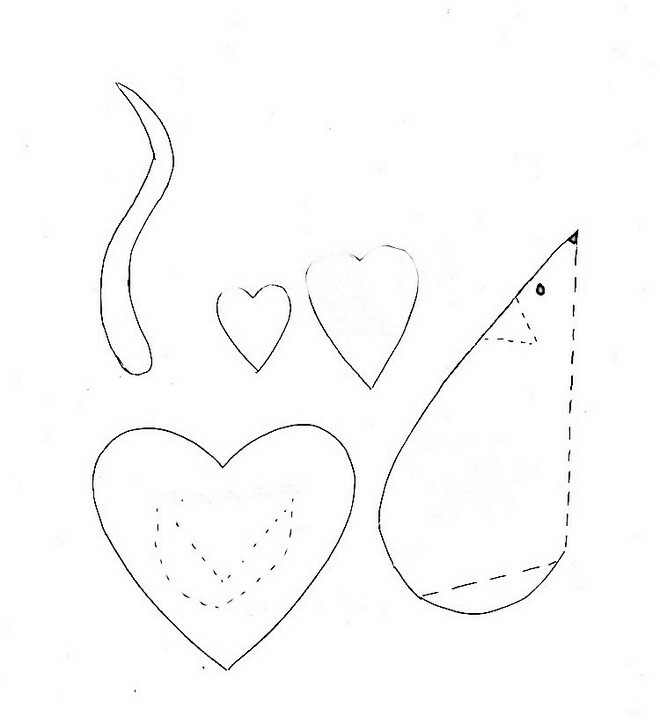 Cut out two small circles from the white sheet of paper, and from the black – two small hearts. First glue the circles, then the hearts. Take a black marker and draw eyebrows, eyelashes and just ordinary patterns. 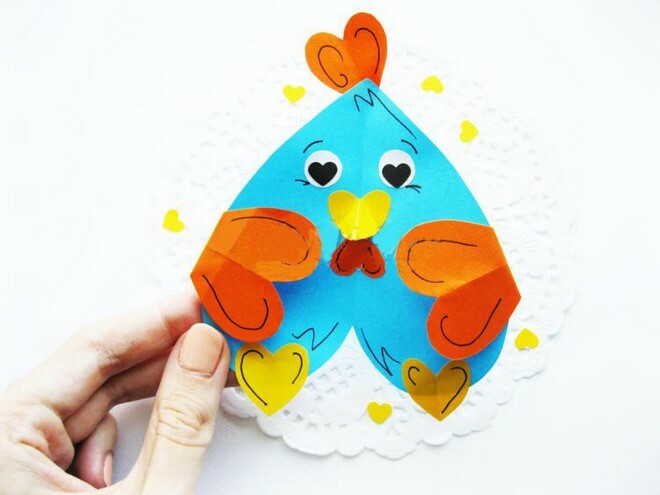 Our bright chicken from paper hearts is ready! Scroll through our gallery of ideas and get inspired for more amazing heart animals! 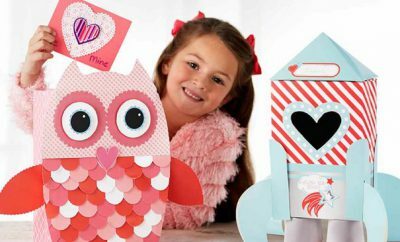 Have fun crafting with your kids this Valentine’s Day!